Higher resolution (1024x1600) versions: Hα (b/w) and color. 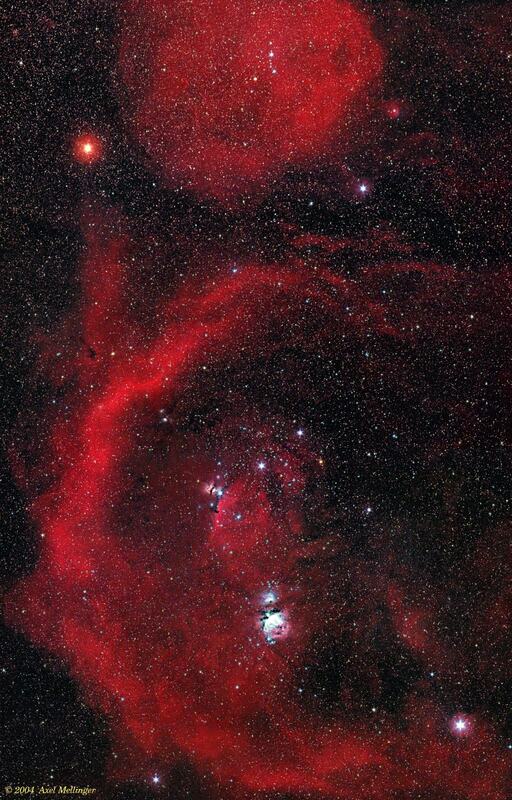 The constellation of Orion features one of the largest emission nebulae in the sky: Barnard's loop (discoverd by E. E. Barnard around 1900), which was probably formed by a series of supernova explosions some 3 million years ago. Also visible are Great Orion Nebula (M42, overexposed) and the Horsehead Nebula. 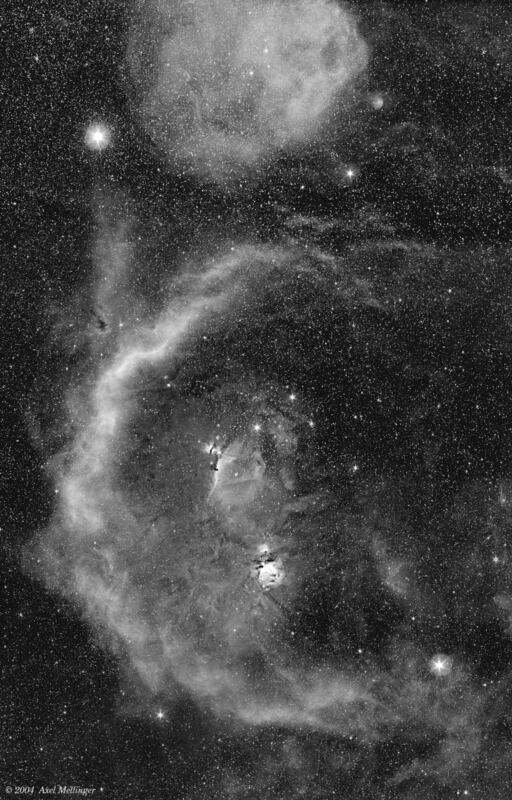 This Hα/color mosaic is a combination of many CCD and film images, recorded over a time span of four years. 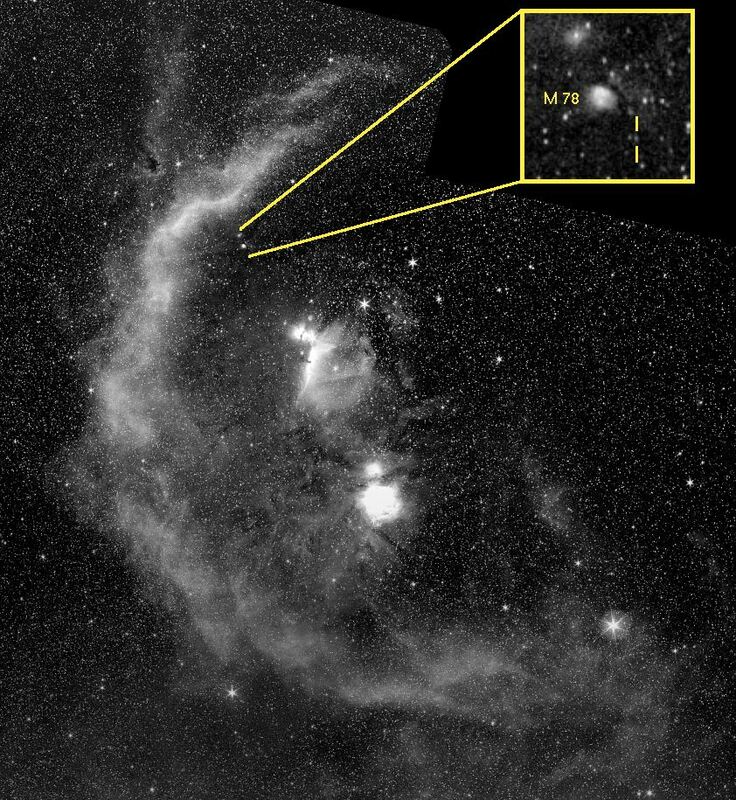 The Hα frames are the most recent and show McNeil's newly discovered nebula (see this enlargement). 8 fields were photographed from locations in Germany and South Africa and stitched together using techniques developed for assembling my all-sky panorama. The color mosaic was recorded on Kodak PJ-400 negative film at Organ Pipe Cactus National Monument, Arizona. Both the red and luminance channel were replaced with the Hα data. Total exposure time: approx. 8.5 hours. Site : Hα: Baruth, Brandenburg (Germany) and Ezeljaght Farm near Sutherland (South Africa). Color: Organ Pipe Cactus National Monument, Arizona.